Far be it from me to say games shouldn’t aim higher. I’m a strong believer in this medium, and I’ve spent years applauding the games that try to address serious and substantial themes within an interactive story. Not succeed, but try. That’s how low the bar is, for the most part. But if a series isn’t going to commit? If it’s dead set on a zero-consequences sandbox with no real-world weight? Then by all means, lean into it. Stop pretending, and just give us the goofs. Which is to say: I played Far Cry 5 last year and found it somewhat of a letdown, and now I’ve played Far Cry: New Dawn a bit and find myself pleasantly surprised. Maybe it’s time (past time, really) Ubisoft stops with the numbered Far Crys and skips straight to the gimmick games. Technically even the premise of Far Cry: New Dawn is a spoiler for Far Cry 5, and whatever, Ubisoft spoiled it in the first trailer. It’s hard for me to feel too sympathetic about spoiling that game’s asinine ending when clearly Ubisoft doesn’t much care about the reveal either. But hey, for due diligence: There are Far Cry 5 spoilers ahead. Ye be warned. Far Cry: New Dawn is set 17 years after the events of Far Cry 5—by which I mean, after the nuclear bombs fell and wiped out America. Yes, that is actually the ending of Far Cry 5. Yes, it is absolutely as ridiculous as it sounds, a moment so boldly stupid it actually kind of works. Having finally whittled down the cultists of Eden’s Gate and made your way to the leader, Joseph Seed, your vengeance is thwarted by a foreign combatant raining hellfire from the sky. Precisely as Seed predicted, I might add. You and Seed flee to the bunker where you started the game, trapped there together to wait out the apocalypse, like the setup to a terrible network sitcom. And that’s where we pick up. As I said, it’s been nearly two decades since the bombs fell and life has returned to America. Hell, life is flourishing. The backwoods of Montana look greener now than they did even a year ago, all sorts of neon-colored foliage and bizarre mutant animals to admire. The people are flourishing too, or at least they were. Having emerged from Montana’s seemingly infinite supply of bunkers, the survivors set up a rudimentary town, and life is peaceful for a time. Then the Highwaymen show up. Yes, it wouldn’t be the post-apocalypse without a roaming band of raiders wearing makeshift armor. These ones are about as generic as they come, setting up a bunch of outposts in the oh-so-strategic mountains of Montana and then...I don’t know, waiting for you to come along and screw it up, I guess. It doesn’t matter. 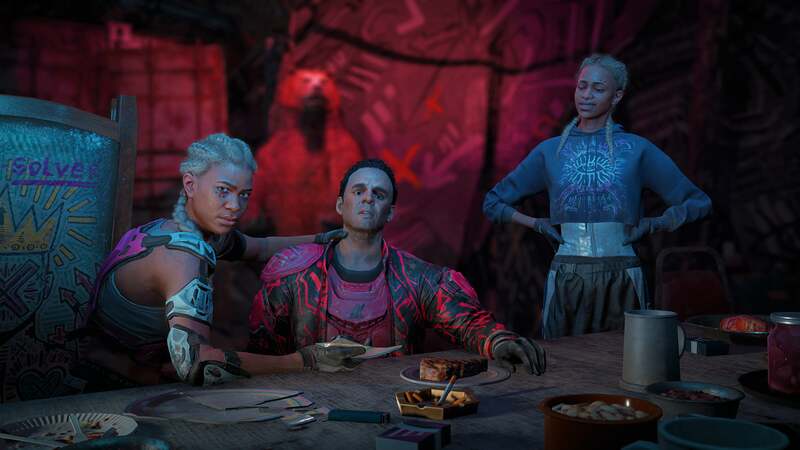 See, the thing is Far Cry: New Dawn is dumb and it seems to know it’s dumb and that’s okay. Far Cry 5 was a dumb game pretending to be smart. It didn’t need to be that way, mind. If Ubisoft had doubled down on the aspects that held promise, put more friction between player and world, leaned into the political and religious iconography it appropriated, it could’ve been a monumental achievement. But it wasn’t. Far Cry 5 squandered every semi-serious element that had any potential, overplayed its villains and its heroes until they felt worse than caricatures, and shoved even that shadow of a story into a playground that was as brainless as any other modern Far Cry. It’s a game where the villain kidnaps you not once but three times, and does so by shooting you with a drug-filled bullet. Yeah. Far Cry: New Dawn is a dumb game that’s okay with being dumb, and it’s better for it. It’s a game where “Hit him with the Bliss Bullets” wouldn’t even cause you to raise an eyebrow. Ten minutes into the game I summoned a trained bear by ringing a church bell, then hammered its mutant face with a shotgun until it finally keeled over and I could snag the key around its neck. I befriended a wild boar. I followed hallucinations around an island. And sure, a lot of these aspects will sound familiar if you played Far Cry 5—but there, the silliness was set against a dead-serious backdrop, a tonal inconsistency I never quite felt comfortable with. 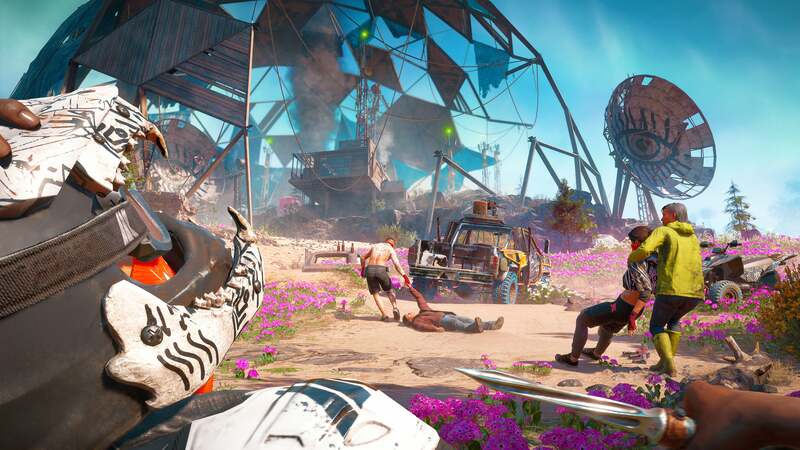 There’s no such tension in Far Cry: New Dawn, at least not that I’ve seen. After all, this is a game that follows on from Far Cry 5’s ridiculous ending. On that alone, it’s hard to take New Dawn seriously. With the story comfortably pulp, New Dawn is free to play with its setting in a way Far Cry 3, 4, and 5 haven’t really had the luxury. And unlike Far Cry Primal which was inhibited by uh, not being able to have any real dialogue, New Dawn is still close enough to our own time period to have engaging characters and interesting missions. Even better, Ubisoft’s made some real changes to the formula this time. Not earth-shattering changes, to be clear, but the series desperately needed a reinvention and New Dawn is prepped to deliver. Like Assassin’s Creed the last two years, Far Cry is experimenting with lightweight RPG mechanics. Guns and enemies now have levels from one to four, with one most common and four the rarest. It can be a bit disorienting, as your usual Far Cry tactics might not work anymore. Not early on, at least. I’m a fan of the “Silenced Sniper Rifle, No Alarms” outpost approach for instance, but the silenced sniper rifle is a top-tier item this time. It’ll be a long while before I unlock it. Speaking of which, outposts are different as well. 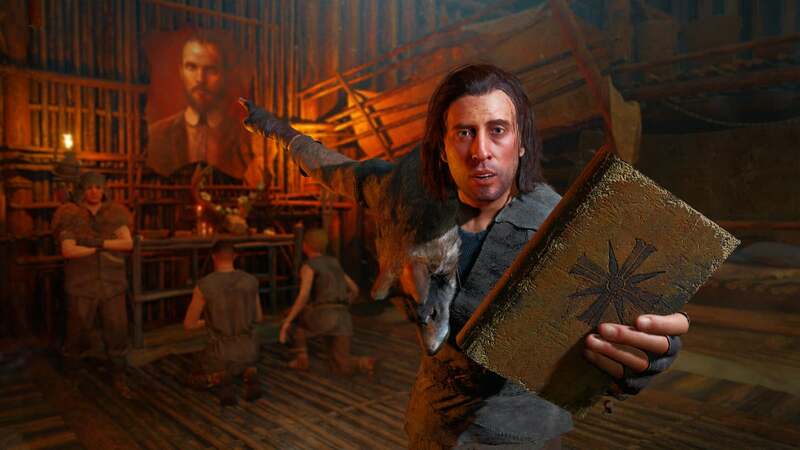 The outpost is really the core of Far Cry. 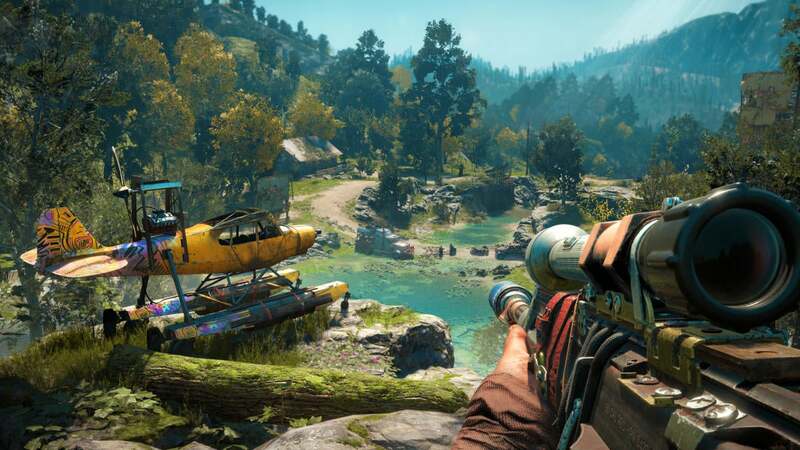 Throw a couple of buildings together, pepper them with enemies, and then set the player loose—that’s the appeal of Far Cry, the series. But the outpost’s also felt stale these last few entries. To some extent it’s the ability to fall back on the same old tactics, but that speaks to a deeper issue: Far Cry’s AI is moronic. Even end-game outposts never felt very difficult, and when you’d captured one you never really thought about it again. New Dawn hopes to fix both those issues in one fell swoop. Outposts are now repeatable—indefinitely, I think. When you capture an outpost you have two options: Keep it and use it as a fast travel point, or ransom it back to the enemy in exchange for resources. The latter option is always available once you’ve captured an outpost, so you can keep hold of one for a while and then sell it back whenever you need an influx of goods. Ransom an outpost and it repopulates with enemies, theoretically stronger and more alert than before. I didn’t mess with this feature during my demo but I’m definitely intrigued by the idea. Outposts are long past due for an upgrade, and this seems like a great way to bolster the late-game a bit. Resources are important too. You’re no longer crafting new wallets or what-have-you. Instead you’re upgrading an entire home base, which then grants you many of the perks you used to unlock by leveling. Want more medkits, for instance? Upgrade the infirmary. Better guns? Upgrade the armory. It reminds me a lot of Assassin’s Creed II’s celebrated Villa Auditore, and that’s a welcome homage in my book. 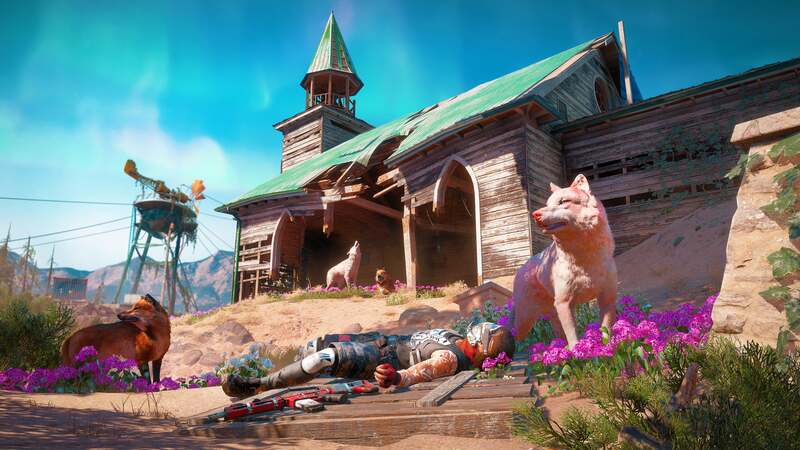 But it’s Far Cry: New Dawn’s other live-game feature that I’m most interested in, I think. Once you’ve scored a bit of ethanol early in the campaign you’ll be able to charter a helicopter and go on “Expeditions,” little one-off missions that take you to remote parts of the United States. We saw two in our demo, one set aboard a beached aircraft carrier and another at Arizona’s Navajo Bridge. These play like mega-outposts, multi-stage but still self-contained mission areas with dozens of enemies patrolling. Your goal is to get in, secure a package, and get out—but once you pick up the bag, it’s only a matter of time before the alarm goes off and you’re swarmed by enemies. It’s the most imaginative addition to Far Cry by far, and lends itself well to chaotic co-op moments. I had a blast playing it, and am excited to see what other far-flung locales we visit later in New Dawn. I’m looking forward to New Dawn, and that’s honestly more than I hoped. Far Cry 5 was a solid game held back by a dismal story. Far Cry: New Dawn looks like it might capitalize on its predecessor’s mechanical improvements and add a few of its own, while keeping a more consistent tone in the process. Maybe not. As always, we played a small sliver of a much larger experience, and there’s much left to be explored when Far Cry: New Dawn releases February 15. But for now, I’m thinking Ubisoft should abandon the numbered iterations entirely. Give me Blood Dragon. Give me Primal. Give me New Dawn. They’re not high art, but nor are they trying to be something they aren’t.